A few seconds later though, Gary broke his train of thought. “Major. We better get a raise for this.” Fred frowned and turned, but he stopped pain shot through his body and he took a moment to stop and when he next moved instead of just turning his torso he moved his whole body. "What is it?" He asked as he walked over to where Gary stood behind the blast shield. And stopped in his tracks for a moment, plugged in to the console were a pair of ZPM’s still glowing, though one was much brighter than the others. Fred nodded a little. “How did it survive this long with out power? Atlantis drained three just by running the shields for less time than this has probably been here.” Muttered Gary. Fred was surprised that the Sergeant Major had read reports that were outside his domain so to speak. But he didn’t question why Gary knew it, just incase it had been one of Fred's random thoughts one day to do with power rates or "Do you think the Ancients ever made one of the De Vinci flying machines, you know like the square parachute thing or the cork screw peddle powered helicopter?" So he just played it off with a shrug. “Shields constantly battered by the sea as opposed to the equivalent of a screen saver for a few thousand years I'd guess.” He then added. “Plus it had the cities ZPM that was plugged in at the chair room to leach off of for the first few centuries.” It then clicked. “Likely why Harly detected it. As soon as we plugged something in to the main power socket it started to leach off of that.” Gary nodded Fred had been worried he was going to need to use some kind of allegory to describe it, but he wasnt the most tech savvy man out there. He and Gary looked around and all the wires seamed to come to the console they were at, and then one was connected to the wall via a crystal interface. Like an extension lead or one of those timers people used to either save money on the electricity bill or to make your friendly neighbourhood burglar think you were in when it was dark. Gary took hold of it and looked to Fred who nodded and the Sergeant Major gave a tug and the cable fell out, the wall that was the door way suddenly disappeared, clearly the projection needed some kind of power to stay up, and a few of the lights dimmed but kept running clearly the door had some kind of fail safe or was just a shield and hologram projection. A tech team could figure that out later and the lights were likely running of the standard towers power provided by the Naquide generator, which was why the light output now mat hed the lights in the hallway. That caused Fred to turn on his weapon light. “That did it Major.” Came Harlys voice over the radio. “Harly, you’ll want to come and see this…” he began but she replied with. “Just bring me anything interesting you find, I am working on something at the moment.” Fred looked to Gary and shrugged as he bent down and tapped the top of the brighter ZPM, he assumed it had more juice and was fresh with the other one being almost empty, it should be enough to power the room till the research team arrived. Once the ZPM was extracted carfully and in Fred’s hand he looked at it for a moment before noticing the room had gotten darker as the lights on the consoles had dimmed a little more but they were still on. “Spooky.” Mumbled Gary. Fred nodded. “yeah lets get back to the others.” He said as he turned and left the room. It didn’t take them long to return and once they did they kept the ZPM hidden, a little surprise couldn’t hurt. Thankfully he did carry bin bags on his plate carrier so it was hidden away and he walked up to Harly’s console she looked up finally and frowned. “What did you find?” She asked he smiled as he put the bag upside down on the console and whipped the bag off and smiled. “This.” He said. She lit up for a moment. “Oh that’s amazing.” But then her eyes glanced back at the screen and she frowned. Fred frowned in response stepping closer and pushing the bin bag back in to his utility pouch. SG-7 stepped through the gate, grateful to see their truck still present. "Denis, see if any of our rations are in there still." Brian said, and went to his radio, "Sierra Golf Twelve, this is Sierra Golf Seven. We're back, lots of stuff to tell you, but I've got a rather important request from the SGC. Have you heard from Sierra Golf One?" Brian asked. "Okay, looks like we have half a box still in here. I forgot this one when we unloaded." Denis said and pulled out the individual rations. "First up, ah..." Denis was cut off by Brian. "Hard pass from me with anything that has fish." Brian said. Denis chuckled, and tossed him one of the boxes. "Then that one should do for you." Denis said. Brian looked it over. "What's a terrine?" Brian asked while Denis picked up the next box. "It's like a loaf made of meat." Denis replied. "Well, this all sounds good then. Venison terrine, bean, sausauge and duck casserole...never had duck but can't be far off from chicken. Creole pork with rice and pineapple. Nicely done, Sergeant." Brian said as he pulled his knife out to cut open the box. "Next up, we have option 2. Salmon paste with salmon, rice and vegetables and lamb stew." Denis said. Astrid raised her hand. "Ooh. Right here." Astrid said, and got the box tossed to her. "Got enough ration with your salmon?" Brian asked. "Your loss, more fish for me." Astrid replied with a grin. "Next up is forest terrine, stewed pork and potatoes, sausage and sauerkraut. We also have...well, I'm keeping that one. So, that leaves that and this one with sardines, lamb stew with beans and chicken and vegtables." Denis concluded. "I'll take the one with lamb." Nikolai said, taking the box. Denis handed the last one over to Stan. SG-7 gathered around in a loose circle next to their vehicle, sitting down and letting one of their entrees heat up while they picked through the other parts of their rations while they waited on SG-12's response. Fred stood behind Harly as she looked back to her computer, pulling up a gate address on the computer. "It makes no sense." She mumbled as Fred looked over her shoulder the Gate Address was Earths, almost, one symbol was off. "it dosnt match anything in the SGC Database..." She added mumbling. Fred was about to reply when he heard Captain Coffin over his radio, he took hold of the mic and pushed the talk button. "Nice to hear from you again, we got up to a bit of fun ourselves." Almost as if on que he felt his ribs hurt again but managed to hide the grimace he made from his team. "Haven't heard from Colonel Mitchell and his team since they left. We'll make our way back to the gate ASAP, Captain Green's just found something of interest in the database here. But we'll start packing up." He turned to Gary and gave a nod. "Sergeant Major start packing up our gear, leave the generator here though I am sure the SGC will send a research team here ASAP so we can leave it here to keep the things we found in that lab on." Gary nodded as he started to pick up all of his gear again He looked to Charlotte and nodded before he looked to Harly. "Captain, time to down load it all and get going." She nodded. "Yeah I can cross examine the address with the gate map on my tablet." She said as she pushed a few buttons and a loading bar appeared on her tablet as the infomation was passed over. "I'll go see if a Jumper is available. if we have to go after SG one it cant hurt to have some support." Charlotte smiled. "Yeah, be careful seeing as you crashed one already." Fred rolled his eyes as he bound up the stairs to the jumper bay and walked in to the unmarked Jumper, sitting at the controls he touched the console and it slowly activated. Once it was powered up he took a moment to scan the system with his mind, and found it was fine, a little slow as it was warming up, but still, unlike the first one it wasn't damaged. he was sure he'd get a bollocking for crashing the 2nd Jumper. But seeing as it took the rail gun to kill one it seamed like a good choice. Slowly he took the jumper off as the rest of his team made their way down the spire to their truck and began to load up. Fred threw the Jumper in low towards the gate, still carefully, still not sure it wouldn't drop out the sky at any moment, and still not confident in his own flying skills, he saw SG-7 and gave them a wave through the front window as he landed the ship by where SG-1 had left their own truck. Once again he stood and his ribs hurt, he swallowed the pain and straightened his back as he picked up his rifle and opened the rear hatch walking out to see Coffin and his team as he sling his rifle. "Find anything good on your Adventure Captain?" He asked as he glanced up to the tower, hoping to see the rest of his team comming via their truck, though he was also sure that Harly was fussing over the little details and he had a few minuets before they would arrive. "Well, sir," Brian said, standing up, "Turns out P4H-51Y has a mine that might let us make our own ZPMs at some point. Gonna let the scientists take a whack at that." 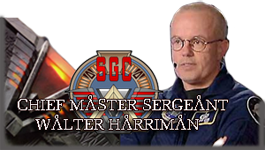 "But General O'Neill asked if we had heard from SG-1, because according to him, they missed at least two check ins now. Sounds like we might get roped into an SAR op...assuming you guys are fit, that is." Brian continued. He wasn't going to bring more light to it than that, but he could tell there were some injuries of some kind going on. It came from being in a profession treating those who felt admitting to an injury was a sign of weakness. The irony was not lost on him that he was technically one of those in the latter category too. "As much as I do not wish to abandon this site after all the prep work that went into it, we cannot ignore the very real danger present. P98-T8R could very well have become a base to an enemy force." Stan added. "Orders were to link up with you, and then I guess we report back in and go from there. We turn this and -41Y over to the eggheads to pour over." Brian said. "Plus, I got the crap kicked out of me by one really angry critter back there, I'd rather not push my luck with two Ancient guardians in one day." "We still have the Spear of Courage. That should solve that problem." Astrid commented. "That was attuned to that defense system, my dear. Much like the sword at Avalon or Camelot was to their respective black knights. And I do not have Doctor Jackson's level of understanding of the Ancients to be guessing names of dragons." Stan replied. "...remember when bullets and explosives used to solve our problems?" Denis asked. "And if they didn't work, you used more and bigger until it did?" "Those were simpler times, my simple friend." Nikolai grunted. Fred nodded as he listened to Coffin's report. He then mentioned being fit and Fred took a moment to think about it. He felt fine, mostly, it was just every now and then his ribs hurt or his bottom two fingers on his left hand. He could work with that he was sure. He'd worked with a staff blast in the back, why not this. "We're fit and able, ribs hurt a little, I, sort of crashed a puddle jumper in to an Ancient robot." He shrugged "Some sort of mad scientist booby trap to his secret lair. It was that or drag the rail gun up all those stairs, after... I had... Sort of destroyed the stairs." He shrugged a little as he walked over to the DHD and started putting in the earth address, he was aware they wernt the only stairs up the tower, but still. "Harly found another gate address, says it cant be real its too close to Earths and isnt in our datebase but we can check that out after we sort out SG One." They could hear SG-12's truck in the back ground, Fred felt no point in waiting for them to arrive before dialling. As Fred hit the second to last Panel he glanced over to Dennis and Nikolai's conversation. He remembered when the SGC had been like that for him, that ended when the Ori came alone and it felt like the Galaxy had yet to recover properly from that. Once the gate opened he took hold of his Mic and spoke. "And an Engineering team with a ladder wouldn't go amiss either. But we found a Puddle Jumper here and we can go after Sierra Golf one if the Admiral gives us the all clear." he glanced to Coffin assuming he wasnt over stepping by Volunteering SG-7 for a SAR job. "Major Rivers we've just heard from SG-7 a moment ago. The Admiral and General O'Neill is here, wait one." "Major Rivers, this is Admiral McRaven. I need you and Captain Coffin to rally your teams and come on home right now. We've got two more teams inbound right now and they're probably getting a busy signal. We'll deal with your camp when we send a follow-up team." "Well, you heard the man, team." Brian said, standing up. Denis passed the empty box around that the rations had come in to use for garbage before popping it into the back. "Not a whole lot we're gonna do here anyway, sir. If we have to do an SAR, we're probably not properly equipped, and we're running pretty hard. We're 2 out of 25 teams. 24 minus SG-1, but still. We'll get someone on the case while we stand down." Brian added to Fred. As soon as they were all ready, SG-7 went through the gate back to Earth. Fred was a little disappointed to not be sent after SG-1 immediately, likely because he already knew as soon as they went for their post off world check up they would discover what he was beginning to suspect were some lightly fractured ribs and fingers and he'd be side lined for at least a few days, likely more. he glanced to Coffin and nodded the Captain had a point, there were other teams. "Yeah." He said as his team showed up and he waved them off to dismount. Harly cradling the ZPM as if it were a baby. "For a while it felt like the SGC only had three teams to its name." He shrugged, wincing again thanks to his ribs. Once SG-7 were through the gate SG-12 followed pretty quickly. Leaving the Jumpers and Trucks behind. Sobek’s forces were not the best when it came to exploration and the majority now finding themselves in a far more hostile galaxy were far more geared towards military expansion. But when Tau’ri are sighted on a planet playing archeologist one can only assume they are up to no good. For a young Goa’uld born in such a new era things may have seemed bleak at first but the Gods were mighty and would always learn to adapt. So would one young Goa’uld chosen to travel to P6G-12M to represent the Crocodile God’s attempts to match the Tau’ri tooth and claw. The Stargate lit up and turning burst to life as the coordinates to this world had been found accurate. A spherical object splashed through the event horizon rolling upon the dirt and grass before coming to a stop. A scanning field was then projected recording the vicinity of the gate. Two dark boots crunches over the ground after exiting from the gate. Leaning down a crocodile guard helmet examined the device, however he was no Jaffa. Silver Kara Kesh on his left hand Kafir gripped the Goa’uld scanning device and stood up and placed it away as he bore witness to the majestic sight ahead of him. Draped in a blue and white robe with golden stripes over light armour he was outfitted for the long hike it would take to reach the Ancient structure. More fluctuations in the gate represented the twelve Jaffa that had been entrusted under his command. As the gate finally fell silent the lead Crocodile Guard approached him slamming his Staff on the ground as a sign of devotion. Kafir knew why he was here, this was too important for the Goa’uld to sit out on and if he couldn’t fulfil such a basic mission then he wouldn’t bother returning home. “We have a long walk ahead of us Jaffa, I advise we move to secure this place quickly.” Kafir’s helmet retracted as he moved up his hands to instead cover his face with a blue hood. “We will leave six guards to activate the beacon and secure the gate, the rest of you will follow me and we will discover the secrets of this world.” It had been many generations since such a discovery as this had been made. It wasn't good enough that he had just returned from the world with the digging site, now he had to lead a squad to one of the two planets they were supposed to ransack. Shak'ran was smarter about it, when he was confronted with the prospect of going into another mission so soon, he quoted his god, who gave him permission to see his family. He recalled the windbag who organized the mission hesitating at first, before conceding him his leave. But him... young Kae'tar was inexperienced, the commander must've reasoned, and unattached to anything. His parents were already dead (of natural causes at least) and he had found no love or anything. Gods, he now hated Tel'taks... there was nothing inherently wrong with them, it was just... he had spent so much time in them, using that one in particular as shelter and so on... that to say that its environment had grown stale would be an understatement. The soldiers who were with him were a mixed bag, two freshmen and two even older and more experienced than him, the one reason he was in charge was because he already knew the Tau'ri. From a distance, at least. Conflict at this point was inevitable. There, on the horizon, a massive tower vainly spiraled towards the sky, surrounded by smaller buildings. If that was a city, it was a far cry from the buildings of stone and mud and wood he was used to. Kae'tar shook his head as he attempted to convince himself to not amaze himself at such sight. "How wasteful...". "The men who raised buildings at such heights certainly had something to demonstrate to the world", Sol'nesed continued. "So, captain... there appears to be nobody here. Do you want us to check every building, or go straight to the tower?" he asked. "Tower first, then the rest" Kae'tar barked. "Have you brought the notes that our lord Mamers has graciously given to us to help with the translation?". He could bet that he would have to face a translation somewhere. "Yes, captain". Sol'nesed replied. "It is a remarkably easy alphabet, not too different in conception to our own. One symbol, one letter" he added. "Good" the captain dryly said. "There's our landing spot" he pointed as he began to decelerate. Gently, the ship finally landed on a smooth surface, and the cargo door finally opened to reveal the Jaffa team. Kae'tar glared with a queer look at the ground and tapped with his feet on the surface before finally taking the first step. "If what I'm touching with my feet is some kind of metal, then I have never seen a city paved like this". The stones and dirt he used to step on were just light years away from this, and not merely in a physical manner. Few moments later all five had taken their first steps on this world. "What a queer city..." Na'jef observed. "Pointlessly massive buildings, steel pavings... the shape itself doesn't make sense. Even from above, it looked like this city was attached to the ground, rather than built on it". A hyperbole that was far more accurate than the man thought. After having circled the base of the tower for a couple minutes, what appeared to look like a door was found. Kae'tar rose his head towards the sky. "Gods..." he groaned. "Between this tower and everything else in this accursed city, we will need far more than five men to search everything". The other men lowered their heads, demoralized. Kae'tar struggled to find something to raise their morale. "Well, at least it's way taller than it is wide. How many floors, if you had to guess?". "Mission failed, idiot", Kae'tar said to himself. "Ah, let's just enter..." he motioned with his hand. And, amazingly enough... the place was lit. Kind of. It appeared to have suffered a brownout, but the lights were there, if dim. "What do you think, commander? Did we come before or after the Tau'ri?" Na'jef asked. What were the odds that this structure would have been lit for millenia, after all? Kae'tar sighed for a moment, but restrained himself from raising his voice. They were newbies, they were bound to miss some details. "Judging by the metal carriages we saw on the ground on the way here, I'd say they preceded us". Which could only mean that they were the ones who turned the lights on and either forgot to shut them off or couldn't. The men appeared unsatisfied. "Not much to look for, then. If this place had anything at all, they already took it" Sol'nesed remarked. The coward already wanted to return home, but he'll be damned if he will return empty-handed. Once again, Kae'tar restrained himself. "Let's see if they missed a corner" Kae'tar began. "I have the impression that the lights will shut soon, so we will split to save some time. Na'jef, you take with you one of the shy kids, Sol you take the other". Hopefully the more experienced ones would have kept on a leash the shy younglings. "I'll go alone. The projectors will help us communicate with each other". Judging by the size of that tower, it would have taken at least a day to search through even a fifth of it, but better a day divided than three united. They may not even have had three days, and one was already dangerous enough. No time to waste. He made to go in the dimly-lit corridor, but as he turned back he noticed that the others were where he left them. "Go", he motioned with his hand, and then he proceeded alone. Some people really needed to be spurred. Kafir lead his Jaffa Guards towards the tall spires keeping an eye out for further sign of the Tau’ri. He didn’t really think that there would be any real danger, at least not for him. The metal ground they walked on was not quite like a base or ship of Goa’uld design, it felt empty, like there had been no soul put into it. Entering inside was the next step. He supposed the interior was more nice being lit up by various light sources such as the stairs and walls. There was no telling who or what was in a structure this size, it was a great prize. “The Tau’ri must have found something if they departed so quickly, be cautious and stay close to me Jaffa.” Kafir knew the magnitude of this discovery would impress Sobek. “We will need to inform the fleet of our discovery soon enough, first we will see what else lays hidden.” A part of him hoped more Tau’ri remained inside. The espionage service had provided a series of coordinates of planets that the tau'rì had or were still viewing and exploring. Certainly if they had decided to take particular care of some planets considered in the past to be of importance, now for Khnum, those planets were evidently fundamental to the knowledge and power that he desperately tried to reforge in his hands. For this he had sent an exploration team to the planet, a small task force consisting of 10 jaffas and a goa'uld at the head of operations. An Alkesh had been sent to the planet and only at the last moment when he came out of hyperspace, he had hidden from sight to avoid being overridden by any potential enemy or adversary, even Sobek himself or the trusty Achaman. he would have given the information only when he got it and assured it was not false or worse. Inside the Al'kesh orbit we see ten jaffas but we understand that only ten of the ten are really part of the team, while the tenth is the pilot in charge of keeping the ship safe and ready to go. The goa'uld wears a close fitting armor more like those of the Kull warriors, two curved swords are at his back and his face is partly covered by a mask covering his mouth. Slightly long wavy hair, oriental somatic features. We see al'kesh entering the atmosphere and twisting appearing and disappearing from view before heading to the ruins detected and already amplified by reports of espionage. In the goa'uld shuttle, those present are particularly tense, one can not fly a fly until the jaffa at the bomber's controls turns to the goa'uld. "Lord Khan ... we arrived at the coordinates indicated by the espionage reports, we are ready to transport you to the surface of the planet and to make a course for the high orbit so as not to be detected by any tau'rì sensors or other enemy races! " concluded the jaffà turning to the goa'uld. The latter nodded, making his eyes flamed, but the latter, instead of shining a golden light, appeared whiter, almost milk. "Very well, from this moment we will keep the contact closed, we will call only when we have obtained what is required and we will return to the planet Khenem, see not to be detected by Tau'rì or anyone else or I will take off your head and use it as cup from which to drink! " the goa'uld replied, placing himself at the center of the conveyor ring surrounded by nine spare jaffas. the descent on the planet occurred without problems and immediately the goa'uld gave the order to advance towards the ruins. "Jaffà kre'ee, shel'mok'ra!" he exclaimed and immediately the jaffas divided into three groups of three each hiding in the bush. Even the goa'uld activated his cloaking device, disappearing from view. the mission to view those coordinates that could have led to subsequent events had therefore begun. Making his way into the dimly-lit corridor, Kae'tar's gaze finally went on what appeared to be a platform in a corner. Approaching it, he saw a luminous display, with what appeared to be a representation of the Spire, dotted by various points in its structure. Cautiously and watching his back, Kae'tar walked on the platform, only to hear the screeching sound of walls creeping out of the floor. That was enough to make the Jaffa captain's heart race faster than a cougar, but after a few moments of deep breathing he finally found his composure. His fingers reached for the screen, to a representation of the Spire's middle section, and after a moment the walls that sprung from the ground returned in their place. Turning, Kae'tar noticed that the corridor he just traversed had a different layout. It took him a moment to realize that this thing was akin in principle to the rings he was used to. After a few more minutes of exploration, the captain was drawn to a light in a nearby room. It was a holographic projection, an elliptical object of sorts. A representation of the galaxy? Excited, Kae'tar picked the recorder from his pockets and began broadcasting. "Boys? I have found something interesting". The recorder was turned to the holographic object, and then Kae'tar's head reoccupied most of the sight. "You want to come see this. There should be some platforms somewhere on your floor, walk on them and touch the middle section of the Spire, it's delineated by a luminous dot. They're transportation devices of sorts, should spare you the hassle of walking all the way up here. Then follow the light". The transmission ended, and Kae'tar began recording more footage of the thing and taking notes. Little did he know that him and his men were not alone. When the three groups arrived at the entrance of the great wall structure, they understood why the planet had aroused the attention of the Tau'rì and not only. That building was still majestic despite the ruin in which it was abandoned. Surely it had been built by the Ancients, the architecture was theirs. The three groups had arrived almost simultaneously and now the goa'uld at the head of the expedition was looking at the door. He could not trust appearances, he could hide some deadly trap that place, so the goa'uld decided to use one of the jaffas as a guinea pig and open the track. "jaffa ... enter the building with caution, check if there are immediate dangers and report!" he ordered the goa'uld to the jaffa, which, however hesitant, had no other choice. With a cautious step, the warrior entered the building disappearing into the darkness of the place. They passed a few moments when he reappeared. "Free from all danger, we can enter!" the jaffa exclaimed, sure of himself. the goa'uld smiled, after all he would not have risked his life, rather he would have sacrificed one of those miserable jaffas. The group went through a few corridors, covering them entirely to map the building, arriving in an area where something had the goa'uld block. "Alt, recent tracks, we have visits imagined and by the weight of the footsteps, there are two things ... either it's rebel jaffas or another team sent by a rival goa'uld of Khnum!" concluded the goa'uld making his eyes sparkle. "caution, weapons ready to shoot, off the zat's is better!" added the security chief of the jaffa team. Wary of the team sent by Khnum, he went beyond the footsteps left by the men of Kae'tar and headed right where the steps lead. The goa'uld knew the technology alterans, and it did not take long to realize that in front of them, there was a transporter. "Lord Khan ..." but the words of the jaffa were stopped when the goa'uld unsheathed the two huge curved swords and motioned for the team to follow him. In a few moments as it had been before, Khan and his men also found themselves in another part of the building. in the distance a light attracted their attention and with it also the vocation. "As expected, we have company, ready to hit at my order!" Khan ordered looking at his men. the jaffas moved slowly, almost stuck in time, as they approached the hologram room. The mefitis jaffas did not seem to realize what was coming, except Kae'tar, who had heard a faint lament. Kafir had taken cover with his six Crocodile Guards that had joined him in hiding behind the corner as warriors of Khnum arrived shortly behind them. He had been expecting Tau’ri not the competition of other Goa’uld. His Jaffa said nothing and merely awaited his orders as the followers of Khnum soon vanished with help of what had to be some kind of transporter system much like a ring platform. “No one will mention a word of what happens here without my permission.” There was no telling how friendly this Goa’uld would be or even who else had joined them either. Preparing his hand device the blue robed Goa’uld lead his Jaffa into the transporter room. Kafir observed the strange technology in front of him as the Crocodile Guards readied their staff weapons. Reaching forward Kafir activated the transportation system and in a flash it seemed he had picked the correct destination for sounds of those recently having had left the transporter could be heard. Kafir again took the lead leaving the six guards behind him as he sped up eager to make his presence known. The Six Crocodile Guards spread out preparing for possible combat. Indeed in the room ahead Khnum’s forces seemed to be ambushing someone else. It would only be a few more seconds before Kafir would learn the truth.